© Mark Kulstad. Photo taken in Houston inside the I610 Loop, on Edloe between Sunset and Rice Blvd. Notes: Originally from Central America, the Bronzed Cowbird is now abundant/common in southwest Texas and is gradually extending its range north and eastward. It is being spotted with increasing regularity on the Upper Texas Coast. Like the Brown-headed Cowbird, it is a brood parasite, meaning the female lays her eggs in another bird's nest. The foster mother generally does not recognize the difference and cares for the young cowbird as her own, even if it is much larger in size. Nest parasitism by cowbirds has caused declines in certain species such as Kirtland's Warbler and Black-capped Vireo. 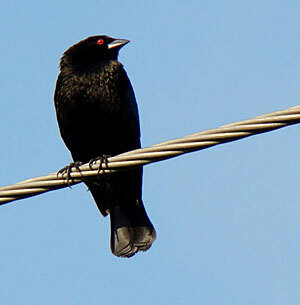 Female Bronzed Cowbirds are dull black; juveniles resemble females but have indistinct streaks on their breasts. Both sexes have brownish orange eyes. In breeding season, male eyes become bright red. Besides the eye coloring, Bronzed Cowbirds are distinguished from Brown-headed Cowbirds by their longer bills and shorter tails.